It boasts stylish artwork, and open American style layout and offers great central space to relax and enjoy Medellin. 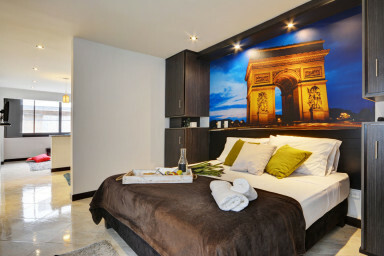 Paris Suite is one of five apartments that comprises our Poblado Suites. The Paris Suite is ideally situated in El Poblado and is essentially brand new having just undergone a complete renovation. It boasts stylish artwork, and open American style layout and offers great central space to relax and enjoy the festive Colombian culture. The Poblado Suites themed apartment rentals offer our guests worldy, executive fully furnished apartments-- each one with its own City decor and flavor. What's your fancy? New York,Tokyo London, Madrid, or Paris. These animated suites are only minutes away from the spirited Parque Lleras!